For both of these Oahu waterfalls, there’s a hiking trail that leads you to the waterfalls. One is a more traditional hiking trail (it’s dirt), and the other is not (it’s paved). Manoa Falls is located in the Manoa neighborhood that’s about 5 miles from Honolulu and Waikiki. And the Manoa neighborhood is basically a university and residential area. So to get to the start of the Manoa Falls Trail, you’ll be passing through residential streets. On the Manoa Falls Trail, you’ll also get a mix of plant life, from a tropical jungle to a bamboo forest to your destination — the waterfalls! For the most part, there’s nothing too difficult about this trail. You do want to have on proper footwear though, because it is a dirt trail, and depending on the season, it can get muddy. 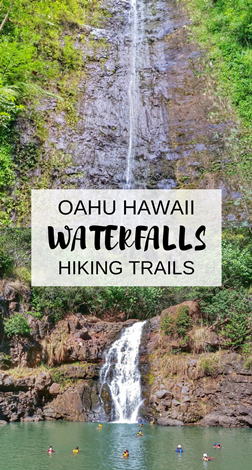 It’s about a 2 mile waterfall hike, and you’ll want to give yourself an hour or two to experience all that this Oahu waterfall hike has to offer! This waterfall hike also gets mentioned now and then because it was sometimes used as the filming location of the TV show Lost. Waimea Falls is located on the North Shore right near the beach famous for surfing, Waimea Bay. Waimea Valley is a destination on its own as a park with tons of plant life and botanical gardens to wander through. And it’s at Waimea Valley that you’ll find the path to Waimea Falls. There is an entry fee to get into the Waimea Valley park. It is an easy paved path to get to the waterfalls, about 2 miles round trip, but you might want to take several detours to look at all of the plants and flowers. There’s also an ancient Hawaiian living site at Waimea Valley too that can distract you from going straight to the waterfalls! Both of these waterfalls have a pool of water at the bottom, and people do get in the water. 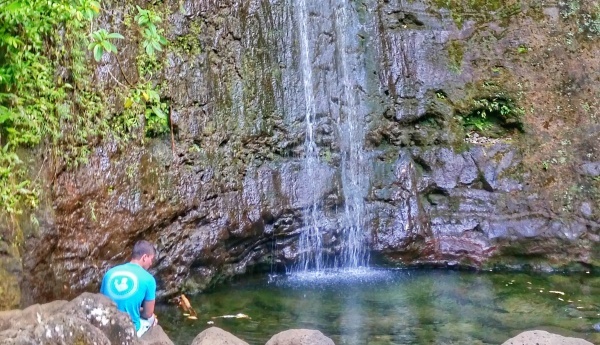 Just be aware that Hawaii is home to dangerous bacteria that’s touched upon in these hiking tips, so it’s best not to take a dip in fresh water anywhere in Hawaii if you have open wounds. 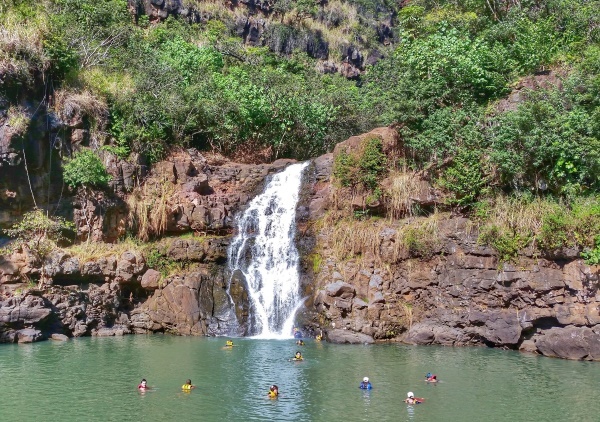 At Waimea Falls, there’s a lifeguard who will provide you with life jackets which are required. Manoa Falls is not monitored. It’s technically off limits because of a risk of landslides and falling rocks. You have to go past a “keep out” sign to get to the waterfall pool. For both of these waterfall hiking trails, it would be most convenient to access if you have a car. While the Oahu bus system does connect all around the island, Manoa Falls and Waimea Falls just aren’t as easy to reach by bus as other popular hikes like the Koko Head hike or Diamond Head crater hike. Koko Head and Diamond Head can be easy to get to by bus because in most cases you can find a single bus from Waikiki to get you close to the entrance of the trails. But the location of Manoa Falls and Waimea Falls means that most likely you’ll have to transfer buses at least once. Although, if you time it right and don’t mind a little extra walking, it’s possible that you only need to take a single bus! That said, if the bus is your choice of transportation on Oahu and you want to see Manoa Falls or Waimea Falls, as long as you don’t mind the extra time it’ll take, it can definitely work out! 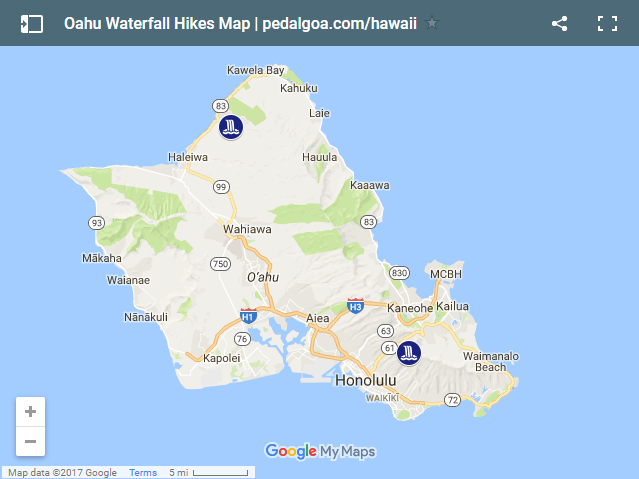 See here below for where these waterfalls hikes are located with these Oahu waterfalls on a map! 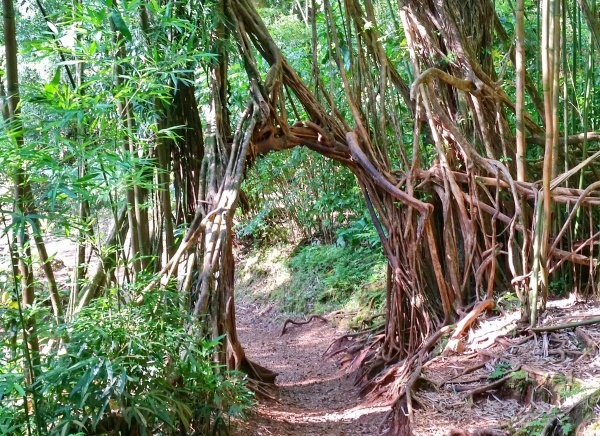 See more hiking trails on a map and have a look to these Oahu hikes for more ideas! Hawaii can get hot. A hike to both Manoa Falls and Waimea Falls means that you’ll be sweating. Maybe a lot. For any hike in Hawaii, even if you’re going to be on the trail for less than an hour, it’s always a very good idea to take water to make sure you stay well-hydrated and SAFE! And for both Manoa Falls Trail and Waimea Falls Trail, you will likely be on the trail for more than an hour, so this means you should really consider bringing along water! This is a popular water bottle in Hawaii. It is a bit heavy (and expensive) but it keeps cold drinks cold! Here are some travel-friendly water bottles. And here are some small backpacks to take a look at to pack along those extra snacks. Because snacks are also a good idea when you’re hitting the trails in Hawaii. For the Manoa Falls Trail, there are times that it can get a little buggy, so you may also consider bringing along some travel-friendly bug repellent wipes or spray like these. You may also want to have in your car some extra socks too, as well as your sandals, just in case you encounter a muddy trail. There are times that the Manoa Falls Trail can get a little muddy.